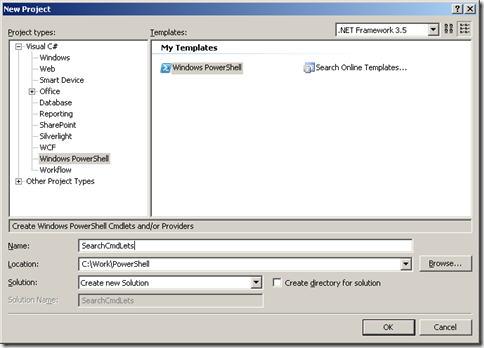 In this blog I already posted many tips on how to use PowerShell on SharePoint. PowerShell has been developed by Microsoft for performing Windows Administration tasks. You can even automate tasks by writing PowerShell scripts. PowerShell works with the .NET object model. This means that you need an in-depth knowledge of the object model of the technology you want to manage with PowerShell. In the case of SharePoint this is a really big beast with a lot of facets. As you or your administrator wants to perform more advanced management tasks your PowerShell commands and scripts will become a lot more complicated. In that case you can extend PowerShell functionality with PowerShell CmdLets. In PowerShell version 1.0 CmdLets are written in managed code, meaning in languages like VB.NET and C#. There exist Visual Studio templates that can used to develop your custom PowerShell CmdLets. Now I hear you think: “Wait! Why bother writing PowerShell CmdLets if you can solve this issue by developing custom STSADM commands?”. At this point you can start a discussion on what the best option is. I advise the following rule of thumb: if you or your administrator only has to manage SharePoint, than you go for custom STSADM commands because in that case STSADM is part of your daily job. If you or your administrator uses PowerShell to perform administrative tasks on different technologies (like SQL Server, Exchange and SharePoint), your best option is PowerShell CmdLets. The base principles of writing PowerShell CmdLets are explained in this MSDN article. In this post I will explain how you can manage Search content sources using PowerShell and how you can develop custom PowerShell CmdLets to create a new content source. You can download the source code for the PowerShell CmdLet here. Be aware that this is demo code and that it need to be extended with solid exception handling. Once you have retrieved an instance of the Shared Service Provider you have access to the services that it hosts. The Search service is one of these services. You can instantiate the Search service by executing the GetContext static method of the Microsoft.Office.Server.Search.Administration.SearchContext class. In this case you can opt to write a PowerShell CmdLet to extend PowerShell functionality. PowerShell CmdLets are written in managed code. There exist a couple of Visual Studio project templates that you can download and use. (The link was down this weekend but I hope it will be restored). Open Visual Studio 2005 and choose Windows PowerShell as project type in the left pane and the Windows PowerShell template in the right pane. This creates a project skeleton consisting of a PSSnapIn file and a class inheriting from. The project contains a reference to the System.Management.Automation assembly. This assembly comes with the PowerShell SDK. Right-click the PSSnapIn file to view the code. The code contains 5 properties that need to be set by you. The most important one is the Name property which will be used when you register your PowerShell CmdLet. The class inherits from PSSnapin which is the base class for creating snap-ins. Snap-ins are the deployment unit of Windows PowerShell and are tagged with a RunInstaller attribute for registering the Snap-in with PowerShell. The name will be used to register the CmdLet. A Snap-in contains one or more CmdLets. A CmdLet is a class that inherits from the base class CmdLet residing in the System.Management.Automation namespace. The Position attribute indicates that this parameter is the first one that need to be specified when the CmdLet is executed. The Mandatory attributes indicates that this attributes is required. The ValueFromPipelineByPropertyName attribute means that the value for this attribute can come from a property in the incoming pipeline object that has the same name as the parameter. You can specify a HelpMessage attribute that will display when help is asked for the CreateContentSource command. The ValidateNotNullOrEmpty is a validation rule indicating that the incoming value cannot be null or empty. The other parameters are defined in a similar way. Each type of content source is created in a separate private method. When an exception occurs the error message is written to the console. When the content source is created and the properties set, a full crawl on the new content source is started. When the code is ready to deploy, build your project. To register the CmdLet with PowerShell open a Visual Studio command prompt, navigate to the bin\debug folder of your project and execute the installer by running the InstallUtil tool. This is the name you specified in the PSSnapIn installer class. 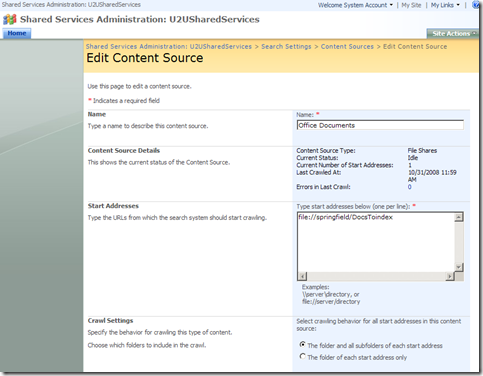 When this command has executed successfully, the new content source will appear in the Search Settings pages of the SharePoint Central Administration. A bit besides the subject of this post, but I read an excellent post on how to index and search your .NET source code and PowerShell scripts here.